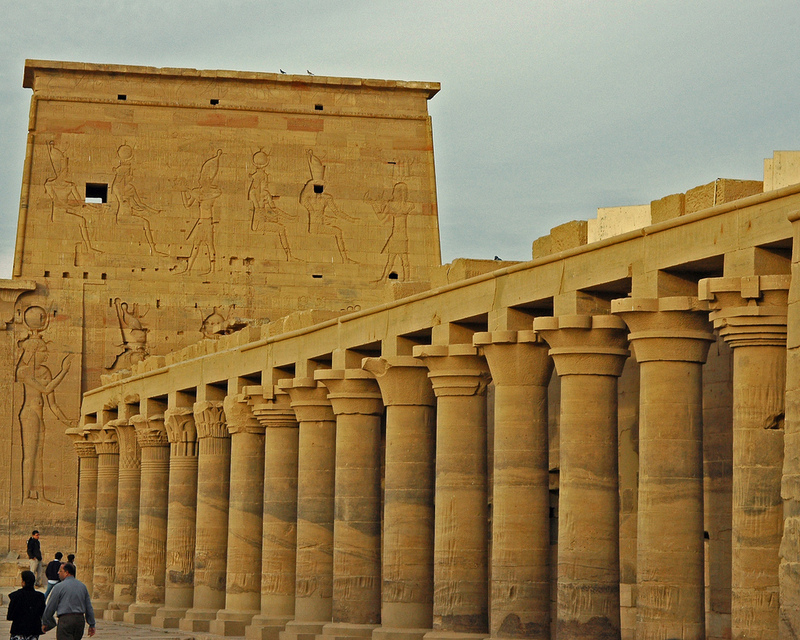 The great Temple of Isis is the principal building on the island . It was begun by Ptolemy II , Philadelphus and completed by Ptolemy III ,Euergetes. The worship of Isis attained great importance during the Graeco-Roman period when her influence extended to Grace itself and to Rome. Numerous inscriptions inform us that Greek and Roman pilgrims. Isis , who embodied the role of nourishing goddess and wife of Osiris (the inundation God) , as the object of a cult Philae long after the introduction of Christianity on Egypt. The decoration of the Great Temple lasted for a much longer period and indeed was never quite finished . Of great interest is the representation of the sacred boat of Isis on a bas-relief. On all holy occasions the idol of the goddess Isis was taken from her shrine and transported n the river to the nearby island of Bigeh. Here she presided over the solemn libation ceremonies at the tomb of the god Orris , her husband and brother. The Great Pylon is an imposing structure,150 feet across and 60 feet in height. I was begun by Ptolemy II, Philadelphus and completed by Ptolemy III, Euergetes I. The main gateway between the towers , however was constructed earlier than the rest of the pylon. It was built by Nectanebo Ii at the same time he constructed his nearby temple. The reliefs on the lintel show Nectanebo dancing before Osiris and Isis , and before Khnum and Hathor. On either side of the thickness of the portal, the king us seen in the presence of various gods; one large relief shows him before Isis. On the right hand thickness of the portal is a French inscription." An 7 de la Republique," commemorating Napoleon's victory by General Desaix over the Mameluke in 1799. The towers of the pylon are adorned with reliefs which show Ptolemy XI , Neos Dionysus (Auletes) skying his enemies before Isis,Horus of Edfu ,and Hathor . Above the king is shown making offerings to Horus and Nephthys, Isis and Horus the child .There is a subsidiary doorway through the tower on the left (west) leading to the birth-house. The birth-house stands between the first and second pylons. In front of the towers are two fallen pink Granite ions of the Roman period. In this spot formerly stood two small obelisks of granite (now in England) erected by Ptolemy VIII, Euergetes II , in 1818 one of these collapsed into the Nile while being removed by Belzoni , the Italian excavator. The obelisk was twenty-two feet in height and weighed about six tones. It was of great interest because the Greek inscriptions on its pedestal were if the same reign as he original hieroglyphic inscriptions on its faces. This enabled William Bankes , in 1816 to identify the car-touche of Cleopatra II, the wife of Euergetes II, and as a result, to contribute to the deciphering of hieroglyphics. Through the main door way is the forecourt of the temple . 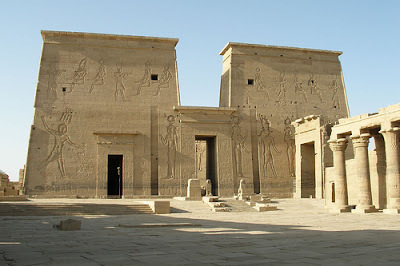 On the Birth House, the "Mammisi" and on the right (east) a colonnade with graceful floral and palm-leaf columns surmounted by sistrum capitals with Hathor heads. 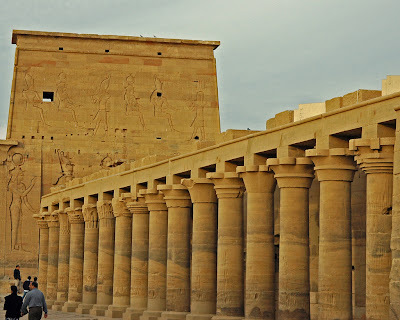 The walls ,columns and scree walls between the columns are decorated with the reliefs of Ptolemaic and Roman kings in the presence of various gods . Some reliefs show the papyrus swaps where legend placed the birth of Horus . The the birth house , the most interesting scene is on the north wall. the hawk of Horus is seen crowned with the Double crown of upper and Lower Egypt standing among the papyrus thickets. Below this Isis is shown with the newly-born Horus in her arms. In the southeast corner of the forecourt stands the earliest piece of work at Philae, a granite altar of Taharqa (B.C 690-664) , the Ethiopian king of the XXV Dynasty. The rooms along the east side were used for storing the temple utensils, books and clothing. The rear wall of the court is formed by the second pylon which is 105 feet across and 40 feet high . 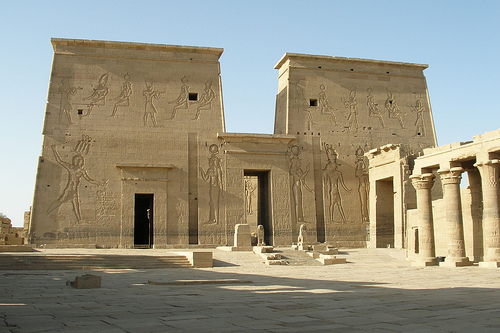 The doorway between the towers is approached on an inclined plane with shallow steps and is adorned with the usual reliefs showing Ptolemy VIII, Euergetes Ii before a series of gods . The towers on either side show Ptolemy XII, Neos Dionysus offering Incense and dedicating sacrificial animals to Horus, Hathor and the other gods. At the base of the eastern tower a mass of the natural granite of the island protrudes. This has been smoothed to from a stele on which Ptolemy VI, Philometor, and his queen, Cleopatra II, Stand before Isis and Horus and before Osiris and Isis , A sic line inscription beneath, dated in the Twenty- fourth year, refers to a grant of land in Nubia made to Isis. On t he east side of the great portal is an inscription by the Christian Bishop Theodosius (reign of Emperor Justinian (A.D.527-565). Just beyond us a small open court. his court was separated from the vestibule by screen walls uniting four columns. Behind these, four other columns help to support the roof. in the hall are the usual worship reliefs. A Christian altar erected about A.D. 600 and numerous Coptic crosses carved on the walls give evidence that this was once used a Christian Church.